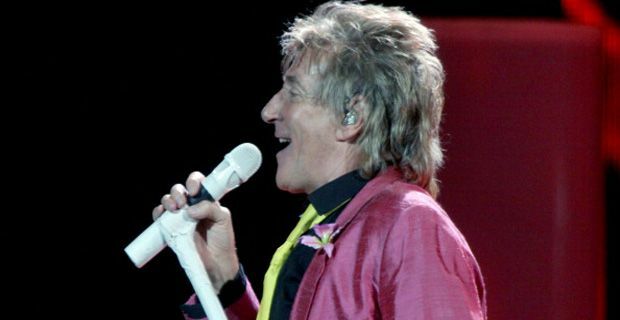 Perennial lothario, serial monogamist and pint size evergreen Rod Stewart has rocketed back to the top of the charts with his first UK number one album for 34 years, Time. The new album is the first original material that the old god of soft rock has released in over twenty years and was inspired by the cathartic process of writing his autobiography. There can be little doubt that probing the annals of blurred, inevitably intoxicated memory must have thrown up some cracking tales and got the juices flowing. There is something reminiscent of Bowie’s new album here that was also provoked by a wander back through the decades and the special moments. Having spent most of the last 20 years getting married to tall women (sorry – that is massively unfair), it is understandable that Stewart has had a lot on outside the studio. Still siring children, Rod is currently being kept young by his two year old son who apparently thinks he’s a plumber. How a two year old knows what a plumber is and how he equates water systems with his dad’s hairstyle is still a mystery but Rod is always game for a laugh and it’s great to see him living life to the full. Time slammed into the chart ahead of singer-songwriter Gabrielle Aplin's debut album English Rain, which is also a new entry, but at number two. Rod was last at the top of the UK album chart with his Greatest Hits Vol 1 in 1979. Stewart said, “I've lived a wonderful life and when I was putting the book together it inspired many of the songs," he said. "If there's anything that God gave, and some people may disagree, he gave me a tremendous vehicle in my voice. "It's just very unique, so I was just lucky to be given this voice."